More and more, I’m using positive reinforcement in my training. And yes, often, I’m using a food reward. When I post a video on Facebook, it never fails that someone comments just to point out that I’m using treats. It’s like a caveat – yeah, that was really cute/impressive/fun … but you used treats so it kinda doesn’t count. 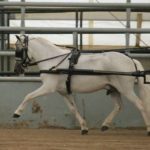 The idea that treats are bad, or cheating, or okay for silly tricks, but don’t count as “real training” is so prevalent in the horse world, that I think the people commenting on my posts don’t even think about it that way. They just know, treats must be commented on so everyone knows that treats are used. Even I’ve been struggling with this paradigm – not that I’m going to stop using treats in my training, but I’ve often thought about choosing to show videos with other forms of reward instead, just to avoid the stigma. I’ve seen people praise trainers that I can’t even stand to watch work with a horse, simply because they “don’t hand feed constantly” like that’s the marker of good horsemanship. No treats = good. Treats = bad. Every time someone implies that my horses only like me because I feed them treats – which happens a lot – I kinda want to give up this whole effort to help other people with their horses and hide in my own barn forever. It might surprise you that for most of my life I used no treats during training. None. But, as a life long horse learner, I’m always looking to learn about better ways of doing something. Science tells us, using positive reinforcement in your training is that better way. Studies have shown that positive reinforcement enhanced learning and memorization of the task itself, as well as creating positive associations with both the training, and with humans. Horses trained with negative reinforcement display significantly more discomfort behavior per training session than horses trained with positive reinforcement. Positive reinforcement training has also been shown to be effective in a small amount of training time, with lasting effects. This approach to training is so powerful. 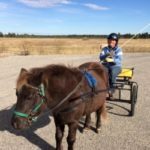 It’s exciting and fun, and I want to share it, so everyone – and their Miniature Horses – can benefit. Skeptical? Curious? Either way, please read the studies I linked above (and many others!) and learn the science behind reward based training. Do more research, and experiment with positive reinforcement with your own horses. 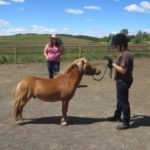 Even if you’re not yet beyond the stigma of treats=bad horsemanship, understanding the basics of learning theory, and using rewards other than food, will still allow you to experiment with the effectiveness of this approach. There is a better way. But yeah, it can involve treats. Here’s a video with some of the fun things I’ve taught using positive reinforcement. And here’s the free training video referred to in the above video. 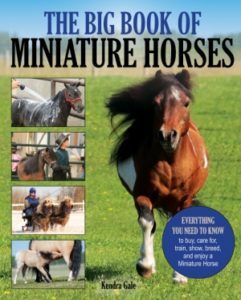 I hope you enjoy and I hope you have fun playing with your Miniature Horses! I was also of the “no treat” mindset for a very long time. Sure, my gelding might get a treat after we were done working, but not as part of training. Then I got a mini whom I have trained to be my service animal. The service dog training community relies very heavily on treats and positive reinforcement, and I decided maybe I should give it a try. So many of my friends have taught their minis to load into cars by forcing them, and I decided this would be a good first test. I taught her simply by showing her that I had a treat, and waiting until she took one step forward towards the car to do give it to her. It took about 40 minutes to get her in the car, but from then on out, she associated the car with yummy things and is almost always eager to load up. That experience sold me on using treats. I think there is so much of a mindset that treat training will create nippy horses that this is part of why horse people shy away from treats. I did have to spend a little time teaching her that she may not nip or go pocket diving for treats, but now she understands this very well and doesn’t do anything more than just nudge my treat carrying pouch if she thinks she did something well and deserves one. At this point, Flirty has learned to go up and down escalators, climb onto playground equipment and all sorts of random things that most horses would have fits about being asked to do. It has also made teaching her to perform alerts for my condition so much faster because it gives her a very concrete reinforcement that she did the right thing. She learns faster than the service dog we often train with, because she is so food motivated. Treats are a great tool for training! I understand your frustration! I have also been training my own horses, ponies, and minis most of my long life. (As well as dogs and one cat to do tricks. I have a BA in Psychology and strongly believe in positive reinforcement for desired behavior in both animals and humans). 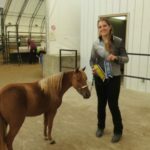 I use hand fed treats to help the animal to associate positive feelings with the activity. In equines, I have learned that chewing while learning helps them to remember the action being rewarded. As long as the animal has been trained to understand that treats are only given when “good manners” are in place, I am all for giving food rewards. Plus lots of praise and rubs. I have been following your posts and…. Excellent Job! I would offer you a brownie if you were standing here next to me. Please do not stop sharing your knowledge and love of training with us. There will always be those naysayers who do not understand how feeding treats helps with learning. It does take time and lots of patience to train treat manners. It is always my animal’s first lesson. They learn “No”, “wait”, “head turn” if a horse, “sit” if a dog or cat, “okay” as treat is offered, and a praise word such as “Excellent” as they eat the treat. Wow! All in just a few seconds! You do a wonderful job showing all these positive things in your video and posts. Positive reinforcement’s been around for a while and food is a great motivator for horses but I think many people associate it with nippiness/pushiness. I was skeptical at first but have seen it work well for my gelding who had fear issues about the cart — Kendra worked with him over the summer and this reward-based system seems to have rewired his brain. Years ago I had a big warmblood gelding (who was chicken despite his size) and terrified of anything plastic – we had him crossing a tarp within minutes using a food reward. As long as it’s the handler controlling the reward, not the horse demanding and you use correct treat protocol – the horse isn’t allowed to beg or “mug”. I found it worked well with my other gelding when I started teaching him tricks three years ago.